The Trinamool Congress swept elections to seven municipal bodies in West Bengal on Thursday, winning 140 of 148 wards. The BJP emerged a distant second with six wards at a time it is trying to grow its base in the state. 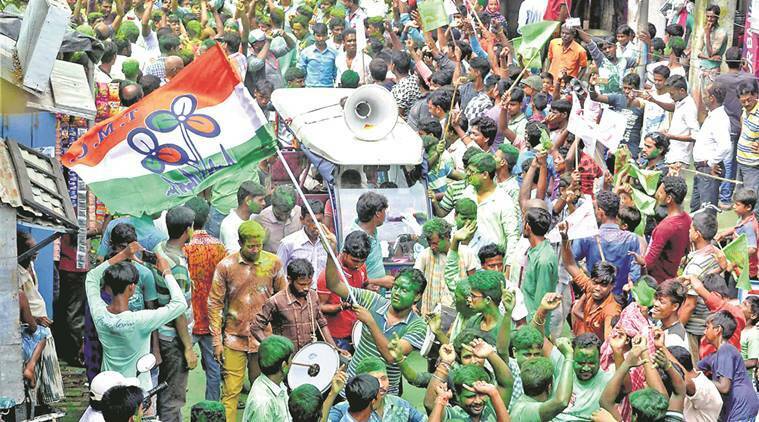 In three civic areas â" Durgapur in Burdwan district, Haldia in East Midnapore and Cooperâs Camp notified area in Nadia â" Trinamool made a clean sweep. The other four civic areas where elections were held were Panskura Municipality in East Midnapore, Dhupguri in Jalpaiguri district, Buniadpur in South Dinajpur and Nalhati in Birbhum. Four of the seats the BJP won were in Dhupguri municipality in Jalpaiguri district. One seat each from Buniadpur municipality in South Dinajpur district and in Panskura in East Midnapore completed the BJPâs tally of six wards. The Left Front won a single seat in Nalhati municipality of Birbhum, the Congress won none. One seat went to an Independent. The CPM said the polls had not been fair. âIt was not an election, rather a forcible capture of civic bodies. There is a nexus among TMC, miscreants and police and people are aware of it,â said CPM MLA Sujan Chakraborty. In Durgapur Municipal Corporation â" the largest of the civic areas to go to polls â" TMC won all 43 wards. State Sports and Youth Affairs Minister Aroop Biswas, who was the TMCâs electio n in-charge in Durgapur, linked the sweep to Banerjeeâs announcement of a separate West Burdwan district and said âpeople have showed their full faith in herâ. He alleged that the BJP attempted to disrupt the poll in Durgapur âby bringing outsiders from Bihar and Jharkhandâ. In Haldia, which was a Left bastion but where the BJP candidates have tailed Trinamoolâs this time, Trinamool is reported to have increased its vote share from previous elections. EntertainmentBhoomi song Trippy Trippy: Is this Sunny Leone's sleaziest dance number? LifestyleHelp my only child survive! BusinessArtificial Intelligence & robotics: Will exit affect Infyâs tech edge?